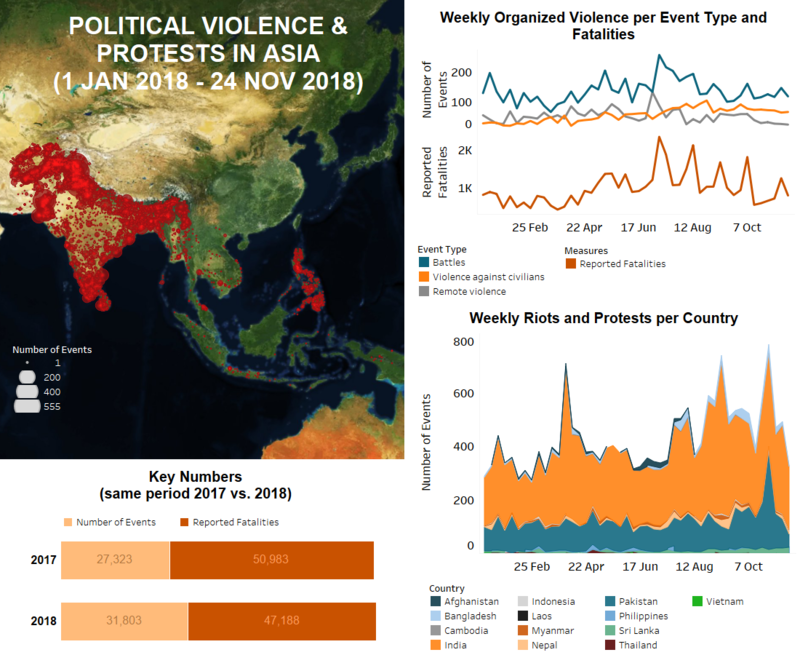 Last week in Asia, overall levels of both organized violence and demonstrations declined across the South and Southeast Asia regions. Key developments include deadly suicide attacks in Afghanistan and Pakistan, a high number of rebel attacks across India, and separatist violence in southern Thailand. In Afghanistan, fierce clashes continued between Taliban militants and Afghan security forces throughout Ghazni province, as well as in different areas of Helmand, Nangarhar, and Logar. According to a report by the United Nations Office for Coordination of Humanitarian Assistance (UNOCHA), over 9,000 families have been recently displaced as a result fighting in the Jaghuri and Malistan districts of Ghazni province. They have since relocated to the neighbouring – and considerably more peaceful – Bamyan Province. Meanwhile in Kabul, an unidentified suicide bomber targeted an Eid Milad-un-Nabi gathering of Sunni clerics inside a wedding hall, leading to a reported 55 fatalities and 93 injuries. While no group has yet claimed responsibility, the Taliban have publicly denounced the attack (Washington Post, 21 November 2018). The bombing bears resemblance to those conducted by the Islamic State (IS), however the group typically targets gatherings of Shiite Muslims so this would be a departure from that. In Pakistan, a suicide attack targeting a local market in lower Orakzai district in Khyber Pakhtunkhwa province on 23 November reportedly left at least 33 people dead. On the same day, suspected Baloch Liberation Army (BLA) militants attempted an attack on the Chinese Consulate in Karachi, resulting in the reported deaths of two police personnel, three militants and two civilians. Meanwhile, in a preemptive bid to stop mass sit-in protests, security forces in Punjab province arrested religious right-wing leaders Khadim Hussain Rizvi of Tehreek-e-Labbaik Pakistan (TLP) and Dr. Asif Ashraf Jalali of Tehreek-e-Labbaik Ya Rasool Allah (TLYRA) along with scores of their party members and activists. Both groups called for renewed protest against the Supreme Court acquittal of a Christian woman on blasphemy charges. Also in Punjab province, lawyers continued their ongoing protest – 23 November was the tenth day – demanding the establishment of a Lahore High Court (LHC) bench in various districts of the province. In Kashmir, following several weeks of ongoing skirmishes between Indian and Pakistani state forces, lower levels of cross-border violence and no fatalities were reported last week. On the contrary, levels of organized violence in India increased last week with rebel violence being reported across the country. On 18 November, at least three people were reportedly killed in a grenade blast at a religious congregation near Amritsar city in Punjab state. Punjab’s chief minister blamed Pakistan’s Inter-Services Intelligence (ISI) and the Pakistan-based masterminds of the Khalistan Liberation Force (KLF) of carrying out the attack with the intent to disrupt communal relations (The Tribune, 22 November 2018). In the state of Jammu and Kashmir, several clashes between militants and state forces reportedly left as many as 12 militants and two soldiers dead. In addition, four civilians, including a district leader of the separatist group Tehreek-e-Hurriyat and a former Special Police Officer (SPO), were allegedly killed last week. The death of Tehreek-e-Hurriyat leader Mir Hafizullah at the hands of unknown gunmen prompted widespread protests as well as clashes between rioters and state forces. The abduction and killing of a former-SPO came as militants continued a campaign of targeted attacks on civilians, including the abduction and release of four others. Several cases of electoral violence were also reported near polling stations during the panchayat (village council) elections, resulting in one reported fatality. Election violence was also recorded during the second phase of the Legislative Assembly elections in Chhattisgarh state. Maoist Naxalite rebels in the region had called for a boycott of the elections and used violence to disrupt the polling, despite heavy deployment of police and paramilitary forces in the Naxalite-affected districts. Armed clashes between security forces and rebels as well as incidents of remote violence were reported from Bijapur and Sukma districts, both Maoist strongholds. In addition, encounters between state forces and Naxal rebels were also reported from the neighbouring states of Jharkhand, Madhya Pradesh and Maharashtra. In Assam, United Liberation Front of Assam-Independent (ULFA-I) rebels launched several attacks on civilians last week, reportedly abducting three men and killing another two. In the remote North Sentinel Island in the Andaman and Nicobar Islands, members of an indigenous tribe allegedly killed an American tourist who illegally reached the island with the intention to convert the natives to Christianity. The isolated Sentinelese tribe is known to violently resist contact to the outside world (United News of India, 21 November 2018). In Bangladesh, the number of reported events further decreased last week. The process of candidate nominations by all political parties for the upcoming general elections in December 2018 continued to dominate the political agenda. While the nomination process remained largely peaceful across the country, it has not been entirely so: an aspiring candidate for the Bangladesh Nationalist Party (BNP) was found murdered in Dhaka city on 22 November. In Nepal, last week, a youth leader, Dipendra Kumar Chaudhary, was shot dead near his residence in Kapilbastu district by unidentified assailants. The killing led to violent demonstrations by locals. Demonstrations were also reported from Sunsari district after an unidentified gunman reportedly shot dead a member of the Muslim community. Demonstrators expressed dissatisfaction with the lack of security provided to the Muslim community and demanded the resignation of Home Minister Ram Bahadur Thapa. Meanwhile, in Sri Lanka, the political deadlock continued almost a month after the unconstitutional sacking of Prime Minister Ranil Wickremesinghe by President Maithripala Sirisena (for more on this, see this past ACLED infographic). Compared to previous weeks, more demonstrations were reported last week with people taking to the streets especially outside the capital, Colombo. Incidents of rioting between members of the opposing political fronts were reported from several local legislative bodies (Pradeshiya Sabha). Fighting between ethnic armed groups continued in northern Shan state in Myanmar last week. The Restoration Council of Shan State/Shan State Army-South (RCSS/SSA-S) and Shan State Progress Party/Shan State Army-North (SSPP/SSA-N) clashed in Hsipaw township, leading to the reported death of three civilians. Meanwhile, the RCSS/SSA-S clashed twice with the Palaung State Liberation Front/Ta’ang National Liberation Army (PSLF/TNLA) in Namtu township. At the border of Rakhine and Chin state, near Paletwa township, the Arakan Army (AA) and Myanmar military battled, resulting in the reported deaths of three Myanmar military soldiers. In Thailand, separatist violence in the south continues. On 18 November, a man was reportedly shot and killed at a tea shop in Yala by suspected separatists, and on 22 November, two civilian defence volunteers were shot while guarding a market in Pattani. As rangers took down a banner calling for an “Independent Patani” in Narathiwat, a bomb exploded. Aside from the violence in the south, in Chiang Rai, soldiers reportedly killed five armed drug traffickers while seizing hundreds of thousands of methamphetamine pills. The event took place near the Myanmar border, in the Golden Triangle region, where drug trafficking has been linked to the ongoing conflict in Myanmar (Myanmar Peace Monitor, 12 June 2018). Last week, in the Philippines, in Zamboanga city, the military again encountered the Abu Sayyaf which led to three reported fatalities, including the deaths of two civilians caught in the crossfire. Violence around the upcoming elections in 2019 is ongoing, as a former mayor, running for mayor again, was reportedly killed in Samar province. Several protests occurred throughout Indonesia last week. In Palembang and Denpasar, demonstrations were staged in support of a school teacher from West Nusa Tenggara, who is facing a six-month jail sentence for defaming her alleged harasser. In Medan city, in front of the United Nations High Commissioner for Refugees (UNHCR) office, dozens of Afghan refugees demonstrated, demanding to be sent to their planned countries of resettlement. Truck and bus drivers also staged a protest in South Sumatra over a decree that prohibits the use of public roads by coal-carrying vehicles. 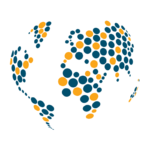 No political violence or protest events were reported in Cambodia, Vietnam or Laos last week.